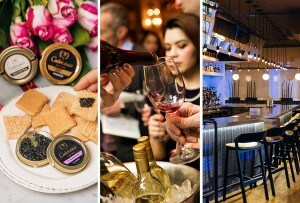 Tasty cures for the munchies from the Gallows, Uni, and more. By Jacqueline Cain·	 4/20/2016, 4:20 a.m. This post was updated on April 19, 2017. Have you ever eaten a ice cream-filled, taco-wrapped burrito? We haven’t, either, but we can imagine Jon Stewart’s classic Enhancement Smoker finding nirvana in such a handheld delight. There’s real science behind “the munchies.” THC, the chemical compound in marijuana that leads to the high, has been found to make mice hungry, and cannabinoids trigger joy-inducing dopamine. Despite recent legalization, any THC-containing foodstuffs—or cold brew—still require a prescription on Massachusetts. But food inspired by weed culture can be found on a few restaurants’ menus around Boston. And we’re not even talking about irreverent spots like Hojoko, with its bacon-wrapped Dogzilla, and “brains on crack;” or Little Donkey, with “chef stoner food” like lamb BLT lettuce wraps, a barbecue scallop, and a spicy Nostrano salami pizza bagel. 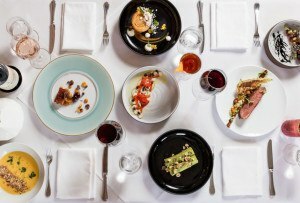 As marijuana picks up mainstream steam, so does fusion food fun. 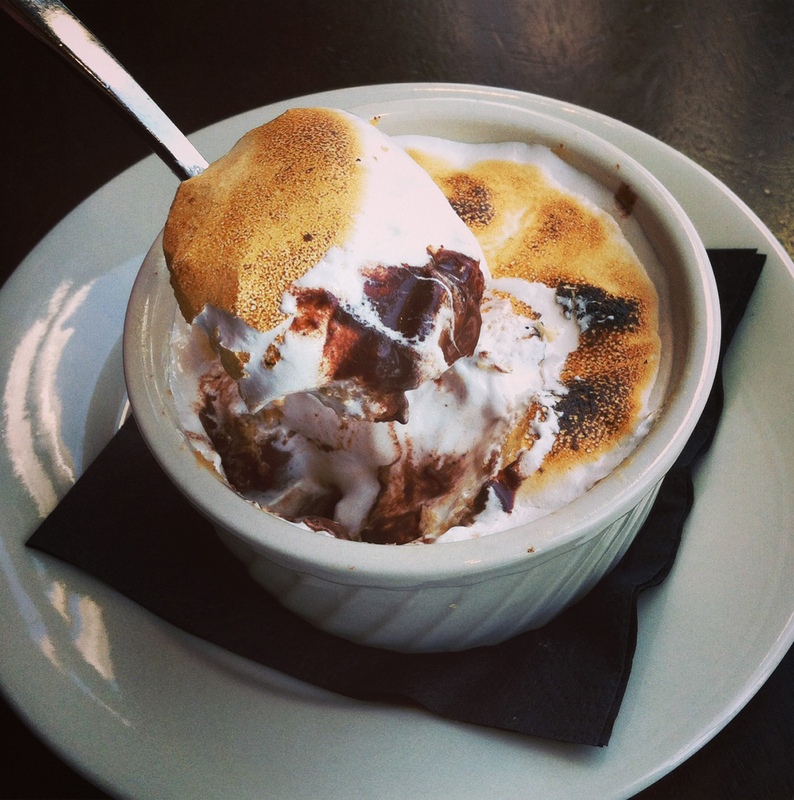 In honor of April 20, here are six (overt) cures for the munchies. Know of any other stoner shoutouts on area menus? Let us know in the comments. The previous April 20 special, the Brrr-ito, knew its target audience. This year, the company is chilling just a little on the stoner references in the promo, but they’re still there for those in the know. 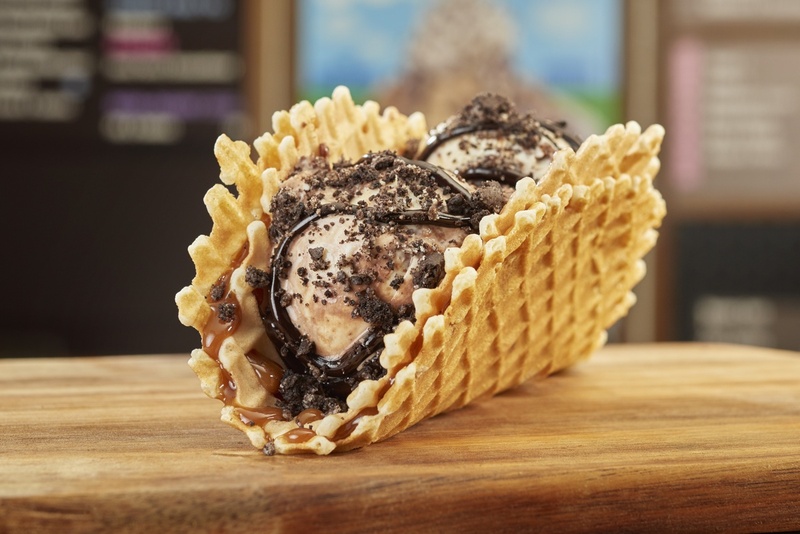 The “perfect way to chill” is two scoops of ice cream wrapped in a soft waffle, a layer of warm caramel, and a crunchy waffle cone taco shell, topped with a fudge drizzle and cookie crumbs. 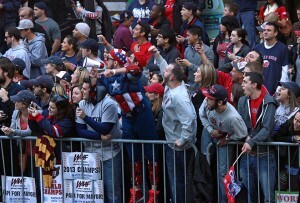 174 Newbury St., Boston, 617-536-5456, 36 J.F.K. St., Cambridge, 617-864-2828, and other locations, benjerry.com. This Mission Hill burger joint teamed up with a nearby smoke shop to create this celebratory special. 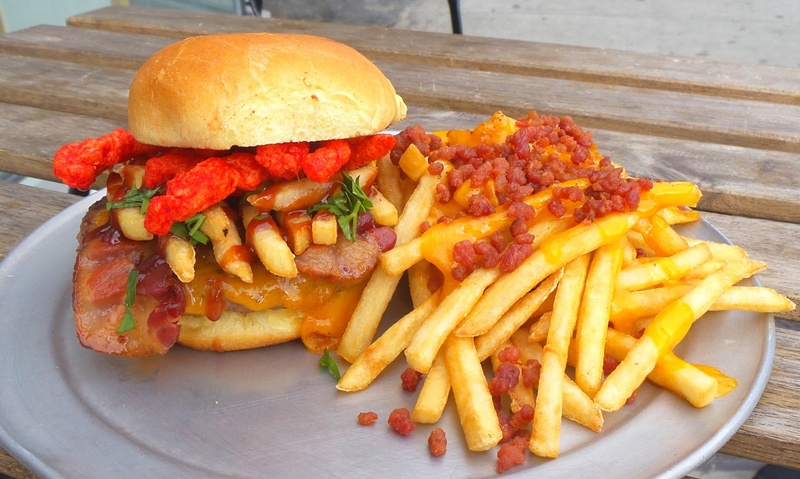 The Kush Groove Beta Burger is loaded with Blazin’ Hot Cheetos, bacon, barbecue sauce, and fries, and sprinkled with some leafy greens. There’s a matching side of fries, too. Get it while it’s hot. 1437 Tremont St., Boston; 617-318-6300, betaburger.co. The 420 Burger at Boston Burger Co.
It’s the most undisguised cure for the munchies on this lengthy menu of specialty burgers, but many others (peanut butter and bananas?) will certainly do the trick. 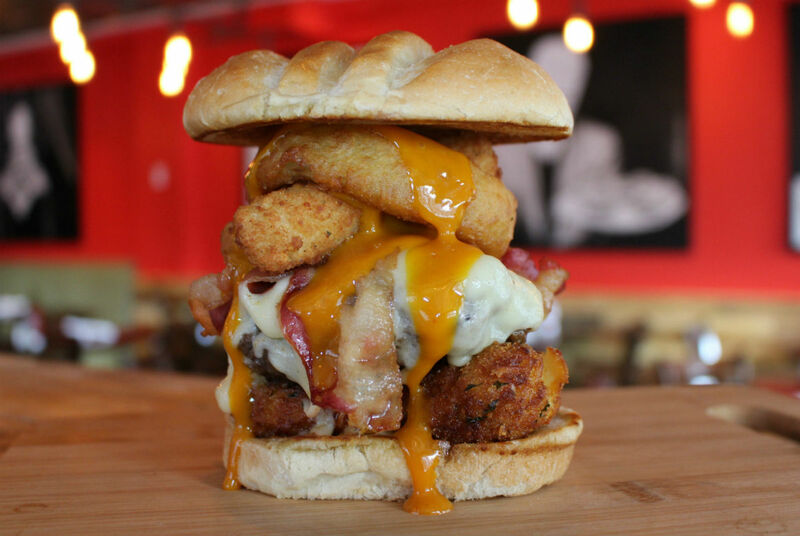 The 420 comes with mozzarella sticks, fried macaroni and cheese, onion rings, and French fries all stacked on top of the patty, plus the requisite condiments. If you order it between 4:20-5:20 p.m. any weekday, it’s just $4.20. This year, the local company doubled down with the HotBox meal delivery kit, too. 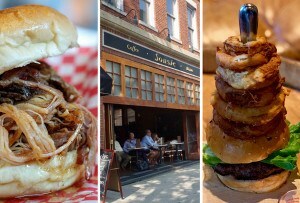 37 Davis Square, 617-440-7361; 1100 Boylston St., Boston, 857-233-4560; and 1105 Massachusetts Ave., Cambridge, 857-242-3605; bostonburgerco.com. As long as we’re fueling stereotypes here, pretty much everything on the menu at this South End gastropub would appeal to hungry stoners. Take, for example, the “Out of Control” poutines, rotating daily specials smothered in everything from Shepard’s pie to tempura vegetables and ponzu glaze. But they’ve really embraced the 420 appeal with this sticky menu staple. 1395 Washington St., Boston, 617-425-0200, thegallowsboston.com. When Mike Gerhart (Magic Hat, Dogfish Head) took over as brewmaster at this longstanding Middlebury, Vt., brewery, he infused a new aura into its beers. 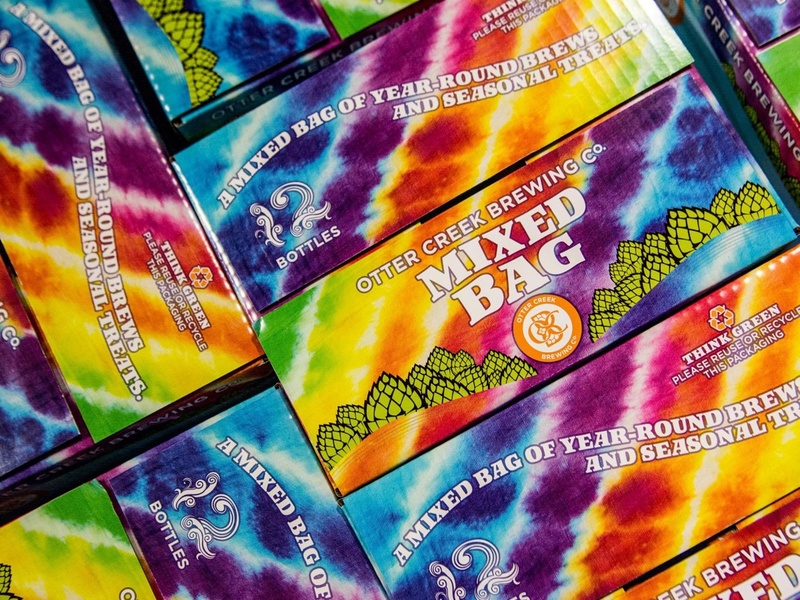 Gerhart recently moved on, but Otter Creek’s “Mixed Bag” 12-pack still features hop-forward brews, labels decorated with clouds swirling from a Volkswagen bus, twirling vines of green cones and leaves, and other hippie references. Keep an eye out for special releases like Joint Custody, a collaboration with Jack’s Abby; and Double Dose, brewed with hop master Lawson’s Finest Liquids. Available in retail stores and select bars and restaurants in Massachusetts, ottercreekbrewing.com. It’s not quite an overt weed reference, but it calls to mind a quintessential stoner flick, and all the munchies-satisfying components of a real White Castle slider are there (and then some). 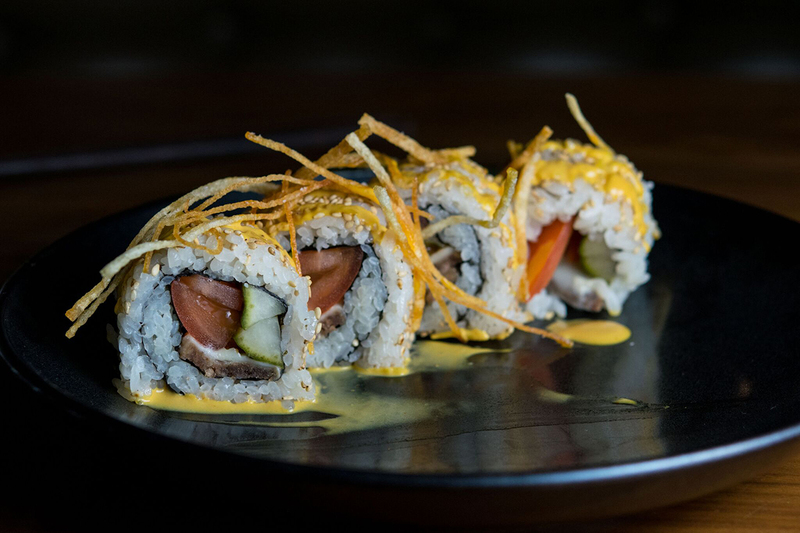 This cheeseburger sushi roll has the craveable patty, a sprinkle of clothbound cheddar, lettuce, tomato, quick-pickled cucumbers, and sesame seeds, and it’s drizzled with a souped-up sauce and topped with crispy fried potato sticks. 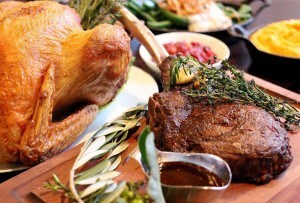 370 Commonwealth Ave., Boston, 617-536-7200, uni-boston.com.